From its humble beginnings - the Fairfax Flea Market in Hollywood to be specific - to the top of the footwear food chain, Jeffrey Campbell has become a byword for platform heels. This is in large part down to its iconic Litas. 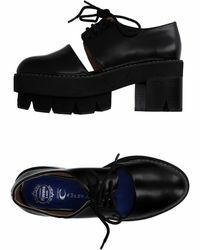 Named after 70's 'Runaway' Lita Ford, these are platforms that are as big in personality as they are inches. Applying the same flair for prints, colour and embellishments to everything, Jeffrey Campbell delivers a collection of statement pumps, sandals and boots.